This semester in Youth Media has been an education like no other – since the beginning of the class, I’ve worked with several different groups of students, become a guest on a podcast that’s now online for all to listen to, and led my friends through a gallery of student work that I couldn’t have been more proud of. Each of these discrete experiences have contributed to a greater understanding of what it means to be a producer and student of Youth Media, what it means to learn as we go and problem-solve on a timeline that affects real people outside of the Muhlen-bubble. Throughout the course of this class, several overarching themes and patterns of behavior can be seen on the part of myself, the other students in Youth Media, and the Building 21 students, though this experience can hardly be boiled down to any monolithic lesson. For instance, there was the constant matter of negotiating identities – negotiating our own identities in the Youth Media class around the B21 students, around each other, around professors, around the greater B21 community when we visited, and so on. In our first meeting with B21 students, when the photography group visited Muhlenberg and we went around campus taking pictures, the Youth Media class neatly lined up against the back wall, sitting in the last possible row of chairs and removing ourselves completely from the B21 students who were about to file in for the first time. Likewise, the B21 students did not “voluntarily” sit in the first row of chairs, as I noted in my field notes from October 15. No one knew where they were situated in this context, both literally and figuratively – though we Youth Media students had read plenty of Freirean theory about become students-teachers and teachers-students, there was little intermixing between the two in our first interactions, though I noted in my field notes that I thought we had at least begun this process (Freire pg. 83). Maddie and I, in our first group pairing together, walked among the students with mostly failed efforts to start conversations, filling the silence “with gentle suggestions, telling them that they could pose with us, use each other in the photo, or manipulate anything they saw around them to reflect what they wanted to show. No bites.” Maddie and I were attempting to negotiate the “teacher” identities that we felt we needed to put on in front of students who might not have known how to use certain types of equipment or take a certain photo using the Rule of Thirds; we tried to appear like we knew what we were doing, but at the same time wanted to seem approachable, open to learning from the students as they learned from us. At this point, this was a very conscious process. I was aware of every single time I spoke and analyzed everything I said to see if it allowed the students to express themselves or if I was asserting myself too much. In short, I thought a lot about what I was doing and how my identity was being perceived. 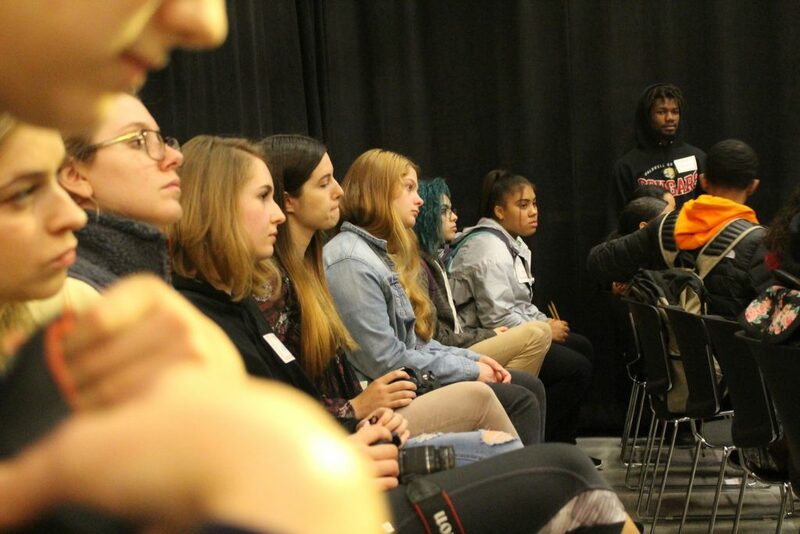 The Youth Media students sit in the back row of the TV studio on October 15, after everyone had taken their pictures. 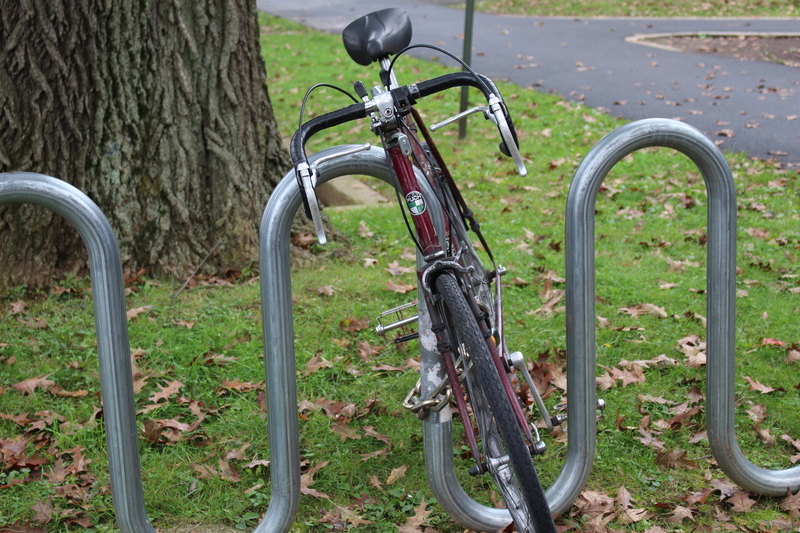 There is some intermixing between B21 and Muhlenberg students, but not much. It was that moment, I think, when Soep & Chavez’s idea of collegial pedagogy stopped being so abstract and intentional. Collegial pedagogy essentially describes the process in which young people and adults work collaboratively in an environment where the young people lead but adults do not disappear; adults are still a part of the editing process and use their expertise to help guide youth without determining their paths or making final decisions. Collegial pedagogy, like our class, also focuses on the end goal of disseminating the media young people make to some kind of public, introducing the guidelines and realities of the greater world into sometimes insular youth media groups (p. 58-59). When Egnor had an idea of what he wanted to make and started to just make it with the help of Colleen’s audio recording knowledge, incorporating our voices into his creation whilst still clearly running the show, collegial pedagogy became real. Egnor wanted his podcast displayed in a public venue, or, even better, an online one, and he wanted us, college students who he had never met, to be a part of that. He and his friends collapsed the identities as teachers that we were still holding on to and adopted part of that mantle for themselves. For instance, when we Youth Media students didn’t know a celebrity they wanted to discuss, they became our educators: “’You don’t know who Tay-K is?! ?’ [Egnor] says, his voice and eyebrows raised. ‘I don’t know anything about any of this,’ I say, ‘This is amazing, you guys know so much.’ I’m leaned back in my chair in awe. Jeremia tries to explain, ‘He’s the person who made the song – pardon my language – “F*ck a beat, I was tryna beat that case.”’ ‘Ohhhhhhh,’ I say, having absolutely no idea what he’s talking about.” The B21 students are the teachers here, and I am undoubtedly the student. Identities were created and collapsed countless times during these discussions, allowing them to be much more malleable than they were at the awkward beginnings of this field work. This passage from my field notes also brings to mind another pattern I noticed throughout the semester: connection through pop culture. In our first meetings with Egnor and his friends, Colleen was our major point of connection with them, as she knew the most about current rappers and sneaker culture, which the B21 students engaged with eagerly. In my own experiences during our first B21 visit, I met with Taylor, who was reluctant at first to take part in an interview. She rarely made eye contact with me and responded “I don’t know” to almost every question. The turning point in our conversation, though, was when she opened up just a bit about her love for music, which turned into a flourishing conversation: “’Who’s your bias?’ I asked. In K-pop fan culture, one’s ‘bias’ is their favorite member of the group. Taylor replied, after some consideration, ‘I think…Key [full name Kim Ki-bum, the group’s lead rapper].’ I replied: ‘No way! He’s mine too!’ Taylor smiled, and we gushed over our shared favorite for a few moments.” Once this touchstone of shared understanding was made through common language and insider knowledge, as “bias” is a term mainly used by avid K-pop fans, our interview was able to proceed smoothly as we traded other bits of pop culture knowledge, trying to see where our likes and dislikes matched up. In this way, Taylor and I were able to practice media-making effectively – she ended up experiencing an interview that was much less like the formal questioning she had likely been imagining (at the beginning of the session, she formulaically asked me, “What does the Heart of Healing mean to you?”) and much more like the podcasting experience I would come to know, full of exploratory wandering and natural conversation. Even the experiences I witnessed with students completing more formal interviews were full of their creative interpretations and explorations of the model set out for them by Tony in our second week of field work. The group of video interviewers/interviewees, CiCi, Craig, Imani, and Angeli, worked with and around the formula that Tony had presented for them at the beginning of the class period. For example, one exchange between CiCi and Angeli went like this: “Angeli [responded], ‘[The Heart of Healing is] when you care for something and then you try and make somebody feel better.’ CiCi then asked a follow-up question: ‘What type of people are we making feel better?’ to which Angeli responded, ‘Someone you care about.’ CiCi ended the interview by saying, ‘That was very nice. I had a nice interview with you. Get home safely,’ causing Angeli to hide her face by pinching the bridge of her nose.” Here, the students were implementing the interview instructions Tony had set out for them – rephrasing questions, thanking the interviewee – but were subverting it with their own inside jokes, turning the process into something all their own. Here is where collaborative identity construction collides with collaborative media construction: when youth are provided with plenty of models to draw inspiration and learn certain forms from, like Tony’s interviewing methods or DJ Academiks’s work, they can synthesize both a sense of self and a physical media product that combines their own individual twists on that model. In conjunction with the pop culture that runs throughout so much of our understanding of youth culture, these students craft their identities as fans or watchers or listeners of everything from K-pop to Tay-K. We as students-teachers of a culture we all share engage in a collaborative identity construction process, in which we exchange knowledge and see how much teaching must be done on either side (i.e. Egnor testing the waters in terms of how much we knew about rappers and deciding to turn our knowledge deficits into a lesson). Once this process is complete, we then enter a process of crafting new collaborative identities, ones in which our differences in knowledge and perceived authority are collapsed. By the end of my session with Taylor, for example, we were just talking about writing and Harry Potter together across the lines of identity that might otherwise have divided us. Collegial pedagogy is still at play here, though, and we as adults are still free to offer up any useful models or advice we might possess whilst still listening and ultimately referring to the young leaders. These models, too, become sites for collective identity construction in which youth tweak and change them to best serve their purposes. The ultimate product is a collaborative piece of media that crosses boundaries of identity whilst still acknowledging those identities as important. 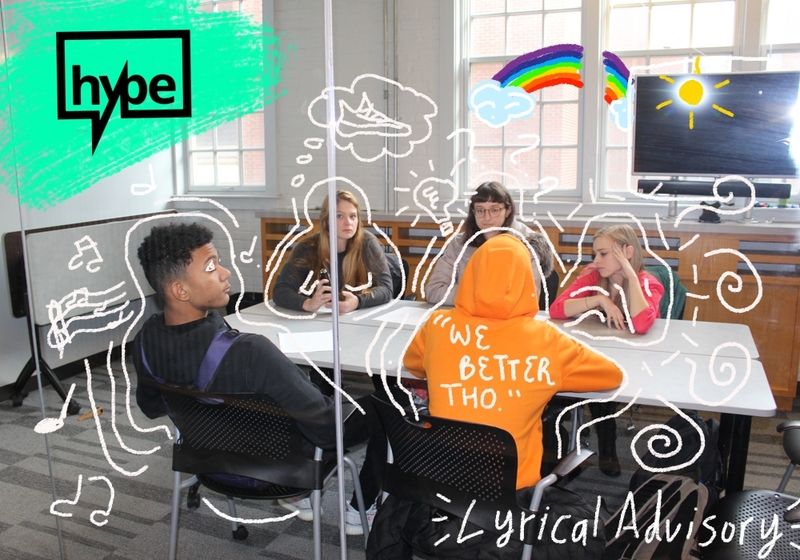 When, during the first episode of Lyrical Advisory, we began talking about mass incarceration, for example, we did not ignore the locations that everyone in the room came from – we all shared our opinions and differences of treatment in terms of race and class and how we all thought about those things were not brushed over. The space was one where all could speak. Through this process, youth media becomes tangible, real. It becomes something more than an effort. It becomes a genuine site of collaboration where everyone feels seen. Walking around the Galleria surrounded by the students’ work was certainly “surreal,” not only for Egnor, who told me this when we briefly talked right in front of the painted text proclaiming the exhibit’s title, but for me, and for everyone else in the class that I spoke to that night. I didn’t want to disturb Egnor too much – beyond the extraordinary moments in which he explored the work alone and freely entered a circle of about six college students, causing one of my friends, Jo, to comment later about how struck she was by his confidence, he was glued to his girlfriend’s (?) side for the duration of his time there. Still, I made sure to introduce him to some of my friends, who have been the subjects of my constant blab about this class and my experiences working with the podcasting group. He shook their hands and introduced himself with ease, stating when I asked how he felt how proud he was to see his work displayed like this and to hear it played aloud for everyone to hear. I was proud, too. Observing as he and the rest of his substantial group of students milled about the space, watching everyone’s videos intently, taking photos of their work hanging up, taking photos of themselves and other people viewing their work with the Canon cameras, exploring the other guest artist’s exhibit in the Martin Art Gallery, all of it was tinged with a rosy glow of pride for me, a heart-filling, throat-closing pride. They’ve worked for this. Oh, they’ve worked for this. And now it’s here, it’s physical, and they’re taking every chance they can get to interact with their work from a new perspective. Of course, we as a Youth Media class have worked for it, too. I immensely enjoyed showing my friends around the work, explaining what we’d been doing all semester, touting the genius of some of the students and pointing out their exceptional skills. My friends eagerly came over to listen to the podcast when it was eventually set up, and though they couldn’t hear it very well, they all seemed excited about tuning in online. This, too, was Egnor’s biggest triumph – when I told him it would be uploaded to a website, his face lit up with joy. That’s the platform he wants, I think: a chance to, as he’s expressed before, “do” what the podcasters he listens to do on the same playing field as them. It seems to me that Egnor doesn’t want to theoretically challenge these podcasters by making work he assesses to be of their caliber, but to actually compete on the podcasting circuit with those he admires, though he told Jo he doesn’t necessarily want to continue on in studying media-making. Still, he’s doing this now; doing, making, owning, unafraid to unabashedly present himself to a group of students five or six years older than him in a space he might not have occupied before. Ismaily, for instance, who had been wandering by herself for a while, told me after I approached her and asked how she was feeling that she had never been to the Center for the Arts. The very place that the teens are presenting some of their most personal, vulnerable, and expressive creations (like Zander’s photo series, which many of my friends were very impressed with) is a place that some of them have never set foot in. Ismaily told me she was picturing a kind of movie screening where rows of chairs would be set up for people to sit and view the films. Still, she expressed that she thought it was cool to see the work arranged as it was. Spending this casual time talking and exploring and gushing with students from Youth Media (many of whom, like Zach and Colleen, I didn’t know at all before this semester began), discussing with B21 students about their impressions of what was being done here, and bringing my friends into the fold of this extraordinary project was invaluable. I was in Youth Media heaven for an hour on this Thursday night, getting to appreciate the fruits of all of our different kinds of labor, fruits that I at one point thought might never grow. Midway through the semester, I’ll admit, I was struggling to see how my goal of having some kind of tangible experience at the end might come true – we were only seeing each student once or twice and schedule messiness meant that these interactions only lasted for around 20 minutes every time. But we came out the other side, and we made. We did. We created. Best of all, we didn’t run the show. The students were the unquestionable leaders of their own work. We were there, putting our readings into action as we worked, keeping in mind the theories and realities of what was at hand, thinking Freirean as we learned alongside them (Colleen, Maddie, and I certainly became students-teachers in the hip-hop culture crash course that was the podcast Lyrical Advisory) and Soep & Chavez as we applied their case studies to what we had to do here and now. My goal was met: we learned and put our learning into action in the same semester, an experience I’ve never had so outwardly in a class before. The learning and doing has always been so individual, so specific. The wandering nature of this class was beautiful in that it was reality. This was no “project” for us; these were real students with real lives and real stuff to get done. So we did it. And that’s what I’ll carry with me for a long time. When I look back on the past few weeks of work at Building 21 – when I scan through the album of photos, the archive of spontaneous, messy video interviews, the faulty memories I’ve compiled week by week in my head – what I notice is the negotiation of what Glynda Hull and co-authors call the “cool pose” in terms of knowing and not-knowing. In my experiences with B21, this “cool pose” has taken its form in a desire to present oneself as withdrawn or closed-off. Some students, like Angeli in our second week of field work, kept their backpacks on at all times and communicated a kind of calculated casual-ness in their body language. Angeli, for example, was working with three of us college students and four Building 21 (referred to from now on as B21) students during the video production week, in which the four B21 students got the chance to act as both interviewer and interviewee, going through a kind of formulaic process laid out by a professor, Tony, to complete their task. When I first wrote about that week in my field notes, I thought of their actions as a kind of parody of Tony’s adult/professional pose, one in which the students tried to stick to the rules as much as they could while still adapting these rules to their own humorous sensibilities. Now, looking back on the footage of an interview like Angeli’s in which the interviewer was CiCi, a friend who constantly cracked sarcastic jokes throughout our time together, I see that there’s more to it than this. 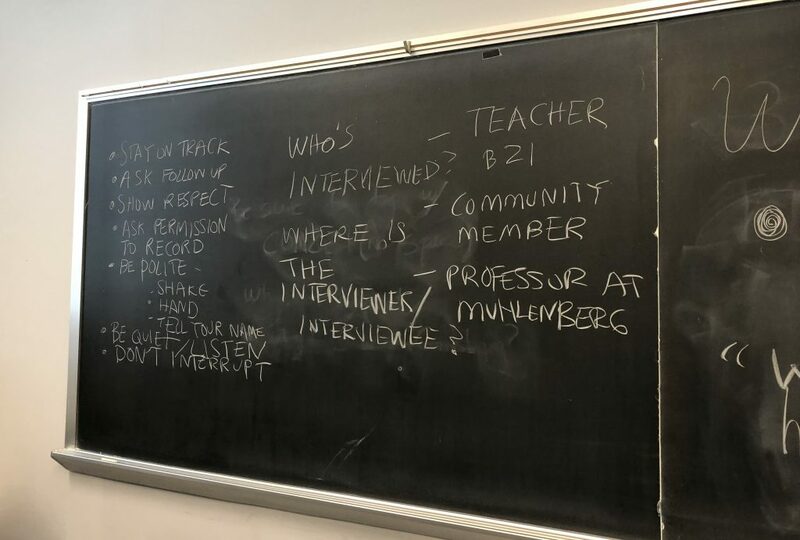 A list of ideas generated by the B21 students in a classroom at Muhlenberg College. This list was compiled after the students witnessed a sample interview session between Tony, a professor, and a B21 student. This sample became a kind of guideline for the students’ behavior in their small group interview sessions. During Angeli’s interview, she sat in a chair in careful nonchalance – one elbow rested on the chair’s plush arm, her hand supporting her chin. She leaned heavily to one side, her left hand shoved into one pocket, her legs crossed at the ankles. When CiCi first asked her the question that everyone else in her group also received, “What does the Heart of Healing [the theme of the students’ projects for the semester] mean to you?,” Angeli raised her eyebrows and said after a few seconds of silence, “I dunno.” At face value, all of these signs might point to a supposed air of “cool”-ness, of being removed from the activity at hand, of not putting too much stock in what is said in a classroom setting. But Angeli’s flickering eyes betrayed this veneer of indifference – we could see she was searching for an answer, and when she arrived at one, “When you care for something and then you try and make somebody feel better,” we could see that it was probably something she’s thought about before, despite the rising tone at the end of her words that communicated uncertainty. Watching the video of this interview back again, I had never before noticed these small instances of body language and how they contributed to the students’ participation as a whole. The signs of nervousness break through the “cool pose” – they break it down, create human moments beyond a desire not to seem too eager and to fit in with other students. The very adoption of the “cool pose” might be motivated by anxiety; after all, Muhlenberg is an unfamiliar environment to most, and a reversion to withdrawn expression might be how some students deal with that strangeness. I noticed too, though, that the “cool pose” can also be expressed by a desire to show that one does care, that one does have a certain level of knowledge. During the first week of field work, for instance, a B21 student named Starling was ready to demonstrate his insider knowledge of the college and the theory/technology the students were working with. He had been a part of the B21/Muhlenberg program before, and knew how the cameras worked. He had ideas for what to take pictures of and was the first to take the camera. Despite the fact that he, like Angeli, adopted a somewhat withdrawn “cool pose” – he kept his hoodie drawn over his face nearly the whole time we worked together – Starling’s “cool pose” involved demonstrating what he did know rather than attempting to appear removed from the activity. He readily stated that he knew the Rule of Thirds and tried to use it in his pictures, and was excited to share his snapshots with the class. When he praised one of his own photos, it might have been an expression of knowledge to the group, an acknowledgement of the fact that his technique was indeed advanced. For Starling, the “cool pose” was a tendency to show that he knew what he was doing, which aligned him less with his classmates (which Angeli’s pretense of cool distance did) and more with the college students and perceived professorial authority figures who were able to validate and display his work. This work itself broke through Starling’s “cool pose” a bit – he gravitated towards nature and enjoyed taking pictures of flowers and abandoned bicycles, allowing his true subjectivity to come forth much in the way Angeli’s hesitant answer did. A photo Starling took during our first week of field work. He took several pictures of this bike, but expressed not being happy with any of them. Here, his experimental subjectivity shone through. Thus, as Glynda Hull and co-authors write, “Youth should be able to produce as well as consume media, because there is power in giving body to one’s ideas and setting them forth in the world.” Despite the “cool pose” and the B21 students’ tendency to gravitate towards it in different ways, at least on a surface-level, their unique ideas were still situated underneath these pretenses and emerged when given the chance to be “set forth into the world,” to be expressed, to be shown to others. Creating media is that chance. -ness that governs when and where certain elements end up being placed. Overall, this experience was certainly no easy road, but I liked the feeling of being able to literally put my voice out there. It’s empowering. “Converged literacy,” as Elisabeth Soep and Vivian Chavez define it in their book Drop That Knowledge: Youth Radio Stories, is more than just a way of thinking about the impact of young people on the world of media and the impact of the world of media on them. It’s a revolution, an agent of social change within itself. The concept is defined by three key factors: “the ability to make and understand boundary-crossing and convention-breaking texts…knowing how to draw and leverage public interest in stories you want to tell; and…the material and imaginative resources to claim and exercise your right to use media to promote justice” (24). Essentially, this boils down to understanding and being able to utilize different forms of media, comprehending what it takes to face a story outwards and disseminate it to an audience (this also includes an understanding of how to best phrase or edit one’s work so that others will want to pay attention, a kind of literacy in and of itself), and, ultimately, using this literacy and convergence of ideas and media in order to bring to light marginalized points of view that have not yet been acknowledged in the mainstream. For Soep & Chavez, youth media programs are vital to the implementation of converged literacy, as programs such as California’s Youth Radio provide a supportive environment in which media producers need not work alone to get their messages out there (44). In Allentown, an organization known as H.Y.P.E. (Healthy Youth Peer Education) serves much the same mission as Soep & Chavez’s Youth Radio, providing students with the tools and guidance necessary to create and disseminate stories of and with their own agency. One such story, a student-made work called “Still Seeking Justice: A HYPE Documentary,” follows the national and local impact of George Zimmerman’s controversial acquittal in his 2013 murder trial after fatally shooting 17-year-old Trayvon Martin, a young black man. Converged literacy is present everywhere in this piece, from the filmmakers’ ability to navigate and create using multiple media sources, splicing together their own video clips with ones from news networks and online advocates, to their focus on an issue of social justice (working towards a future without racial profiling). Interestingly, another definition of convergence that Soep & Chavez use – the youth’s experience in backyard “war zones” where casual and high-stakes conversations and actions take place at the same time – also appears in the piece (27-28). Several of the documentary’s interviewees discuss situations as small-scale as locking one’s car doors in fear when a black man walks by (8:20), while other clips, such as the speech by Trayvon Martin’s mother, equate Martin’s horrific fate with everyone in the audience – “Today it was my son, tomorrow it might be yours” (6:31). These situations, however, aren’t necessarily separate. As in the case of George Zimmerman, whose fear of a black teen in a hoodie escalated to killing, one could easily morph into the other – the scared person who locks their doors might be armed. It’s the same with the teen’s convergent experiences. Their lives do not consist of experiences with racial profiling on one end and youth media programs on the other: both are interconnected and work together to form their unique creations and perspectives. The actual creating and presenting (or uploading) of the documentary evokes converged literacy by allowing the teens to learn new techniques to express these perspectives, meaning that they can participate in a realm of what Soep & Chavez call “digital privilege” that they might never have been able to access before (31). What I’m still not sure about is how converged literacy has changed since the Soep & Chavez article was published – because of the documentary’s presence on YouTube, for example, does the “draw and leverage” aspect of converged literacy now include things like clickbait, which is often employed by content creators to draw in viewers? If media-makers become fluent in these sometimes-manipulative ways of taking in an audience, will converged literacy still fall under the umbrella of positive learning? I’d like to think about this more throughout the semester. 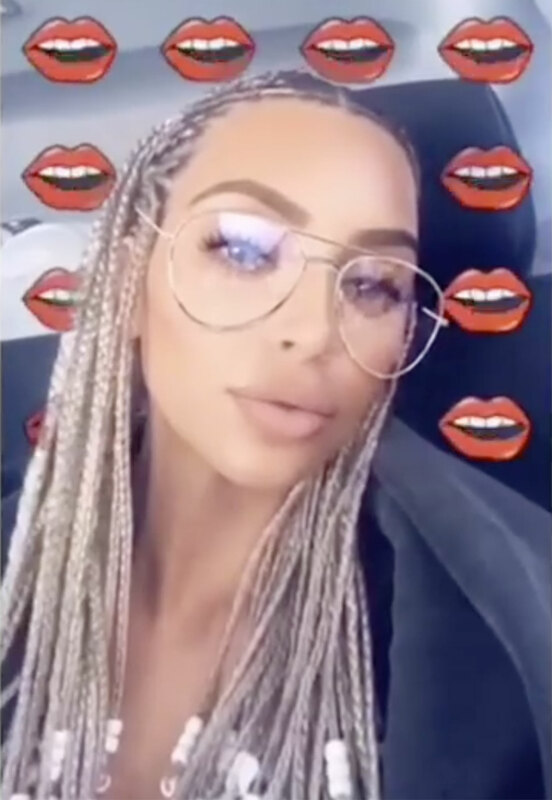 Kim Kardashian shows off her “Bo Derek Braids” (actually a traditional protective hairstyle worn by those with natural hair) on Snapchat. Via https://people.com/style/kim-kardashian-braid-controversry/. …but the criminalized consequences of actually living as a low-income member of a marginalized group in the inner city simultaneously become hegemonically normalized. The gap between the two is where theories about how to arm minority, low-income students with the tools to represent themselves come in. Goodman argues that integrating the students’ “strong command of oral and visual language for use in their local community and in the commercial media environment” into their school day would allow them to “speak, represent, and demand recognition for themselves and their community” (36). While I agree with this idea, I find the manner in which it is outlined in the discourse of youth media a bit problematic. For example, the header on page 29, “Empowered to Speak for Themselves,” implies and requires a third outside party to bestow upon students the gift of agency, as if power cannot come from within their own communities or as if they cannot already speak for themselves. How do we as media scholars provide students with platforms to showcase their own voices without presenting it as a self-congratulatory act, without giving ourselves the active verb – empower – and thereby framing the students’ success as somehow contingent on our participation as an outside party? I’d like to think about this further as we progress throughout the semester. From left: The cartoon versions of Raven, Beast Boy, and Starfire and their live-action counterparts. 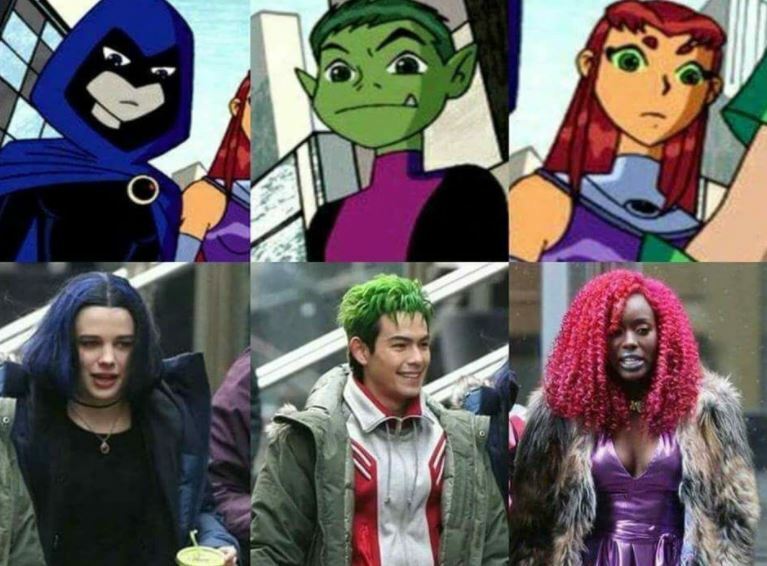 Via https://www.elmetropolitanodigital.com/2018/04/dc-comics-filtran-fotos-de-titans-la-polemica-produccion-de-warner-bros/. I have to say I was surprised to hear their resounding condemnation of Diop’s casting, as most of the opinions I saw on Twitter decidedly defended her and railed against those who complained. Still, I suppose this is a clear example of self-made youth media carving out a spot for these students to express exactly how they feel – these boys are just having a conversation about a character they love, but by recording and disseminating that conversation, their subjectivity is shared and legitimized. In future lessons, I’d like to think more about the gatekeepers to this legitimization: would this podcast ever be heard if it was made on the boys’ headphone microphones instead of in a studio?